Some of us do it diligently and some of us…think about doing it. To be honest, I tend to fall into the later camp sometimes. According to ycharts.com and the Bureau of Economic Analysis in a report published February 2016, the United States personal savings rate was 5.40% and in 2015, the rate was the same. Long Term Average for Savings in the United States is 8.33% according to the same report. 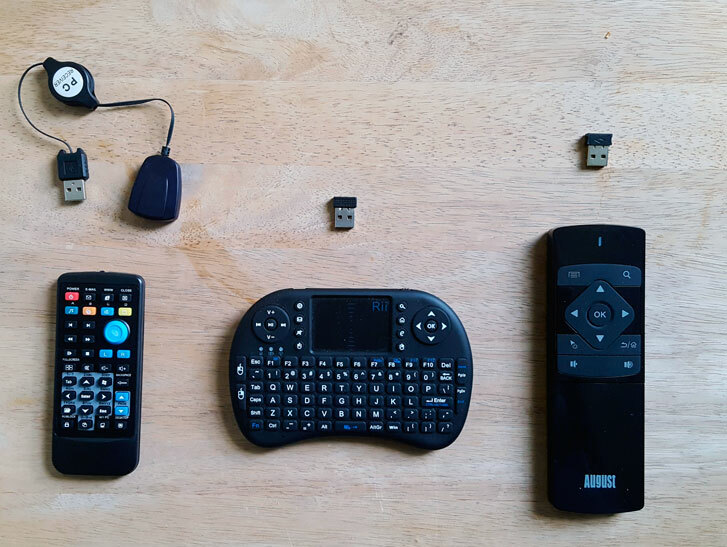 I discovered Digit in September 2015 and I absolutely love it. Allow me to quickly explain what it is and how it can help you save even more of your money without constant input. 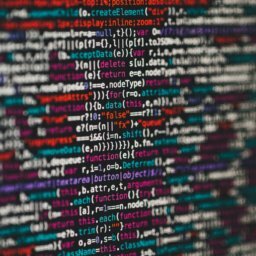 Digit is a savings algorithm which reviews at your current bank account balance and your account spending history to choose the best time to move a small amount of money into your free FDIC-insured Digit bank account. The best part is that the entire program can be managed through simple texting messaging (SMS) on your mobile device. Or using the app available for both Android and iOS. Checking account balance – Digit looks at your current account balance to make sure you are currently able to save. 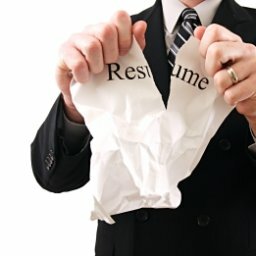 Upcoming income – This includes paychecks or predictable irregular income and such. Upcoming bills – Digit views your bank account to see when and how much your bills cost you month to month. Recent spending – Recent spending comes into the system as well. So as time goes on, Digit looks as your bank account and transactions and chooses an amount that will work best for you on a day to day basis that you probably won’t even miss. So allow me to give you a quick tour on how Digit works and how it can possibly improve your savings life. Digit saves a small amount of money every few days between $1-$50 dollars with an overdraft guarantee. Retrieve your savings anytime with unlimited transfers , balance checks, or even manually move some money into Digit through the app OR by using a text. 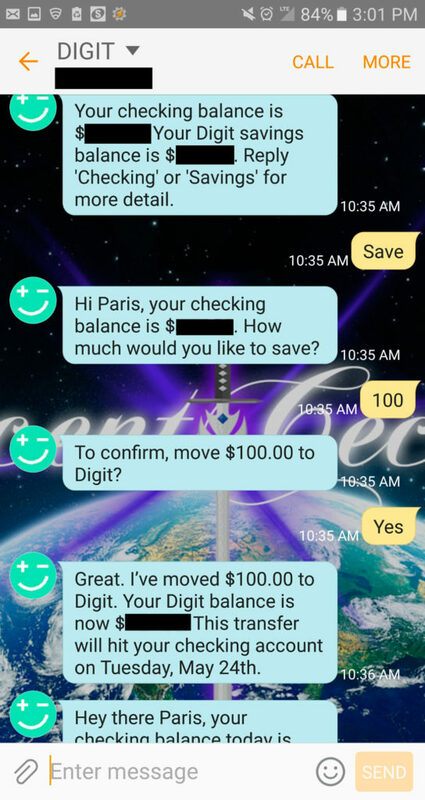 Digit is very simple to manage either through text OR the app and I am going to demonstrate how to do a withdraw and manually saving money on Digit using text messaging and the app. Digit, hold my suitcase full of money! 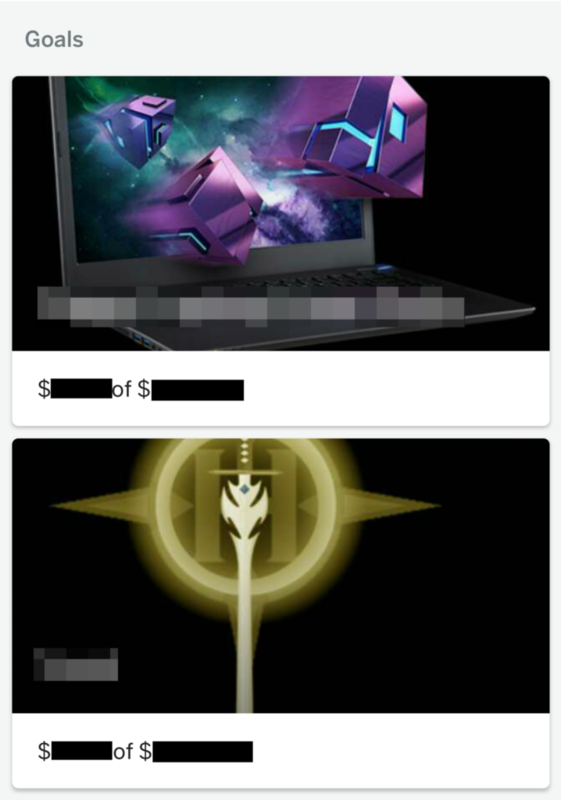 Here are 2 screenshots of me saving a 100 dollars from my checking account with Digit [I blacked out all of my personal finances of course]. On the text messaging commands and on the right is the Digit app itself (Android version).You can see that it has took only 3 commands (SAVE, the amount, and the confirmation). I could have combined the commands as well to reduce the steps (i.e. SAVE 100) and Digit would have replied with the confirmation request. The transfer takes about 1-2 days (not including weekends but I am sure you know that). 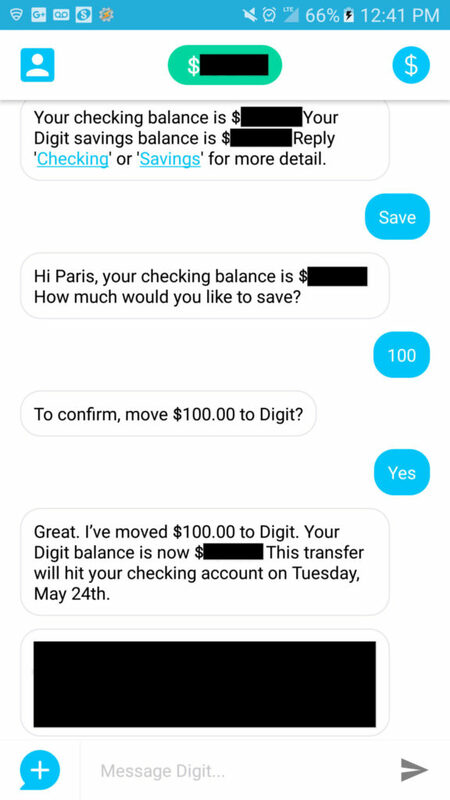 Additionally, when sending a reply to Digit through text messaging or the app, Digit’s response is almost instantaneous, network connection permitting. Additionally, when sending a reply to Digit through text messaging or the app, Digit’s response is almost instantaneous, network connection permitting. Interested in saving with Digit? Sign up and get started for free right now and earn $5! NOTE: You can ignore in the text message background, that’s just the background I have put into my text messages on my phone (its my Youtube logo). Digit system’s automatically prevents overdrafts. To be on the safe side, they do over to cover up to 2 overdrafts per user of their system. I will say in the year I have been using them, I haven’t gotten anywhere close to an overdraft cause by Digit. That isn’t to say it is not possible, but I haven’t experienced it. I started Digit almost a year and I have saved thousands of dollars automatically which have helped when those rainy days came about. Having a versatile and flexible method to saving that takes in account your income and expenses makes all the different when planning for the next event or just setting aside some money. So what are you waiting for? Wait what is this? Another app to try to take the stage from Digit for easy savings? This is getting exciting. The battle for our money never seems to stop. Let’s see what the new challenger brings to the table and how they stand on their on their own feet. So how does Qapital differ from Digit? 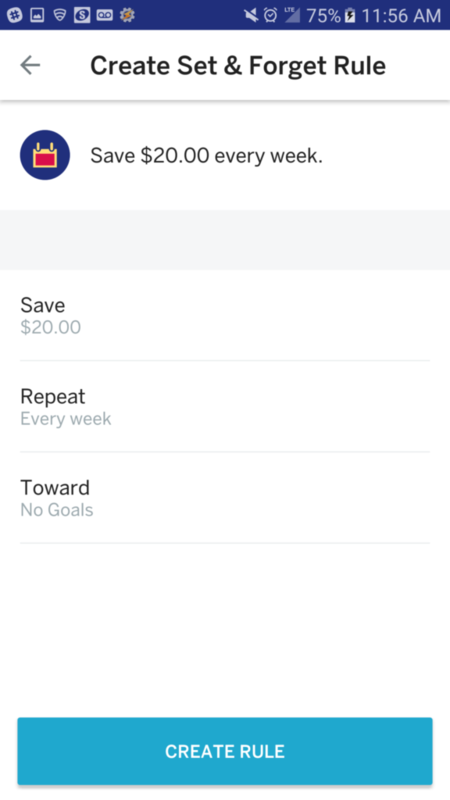 Well Qapital allows you to set up specific savings goals and rules to attain those goals whereas Digit uses their algorithm to determine your save amount. You have more control over your savings with Qapital but Digit runs regardless. I use both at the same time. What is Qapital and how does it work? Qapital is another savings app for Android and iOS but it differs from Digit because you have rules. I discovered Qapital around April 2016. 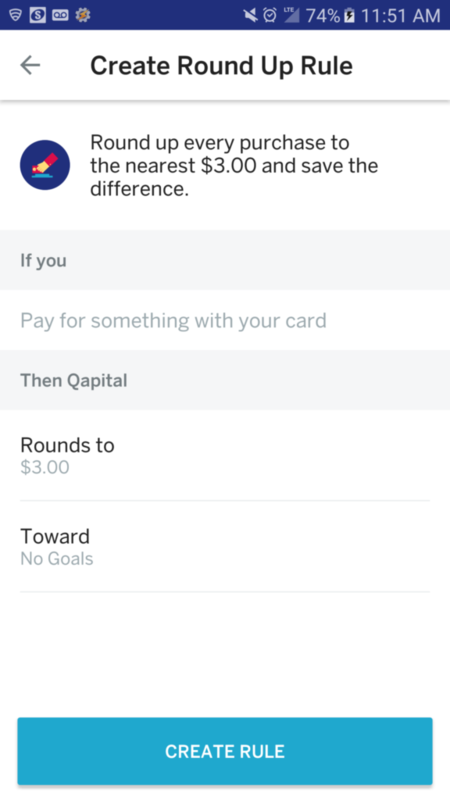 The premise is the same (link your checking account to the app and manage transfers through the app) but Qapital differs due to their rules and goals system.A big change in Qapital is how the system saves as well. Unlike Digit that saves every few days automatically, Qapital saves every Monday and Thursday. So the way this work is that all of your savings (from your rules) during that time are bunched into one transaction until the next transfer date. Because of this, I have seen three-digit savings transactions going into Qapital. Additionally, Qapital does allow you to view that breakdown by rule and/or goal if you wish. Your dates may differ but I am currently on a Monday Thursday schedule. Qapital only has app access and website access, no text messaging control. Qapital let’s you set certain goals and filter your money how you see fit using the above rules. Interested in trying Qapital? Get $5 right now in your new account! 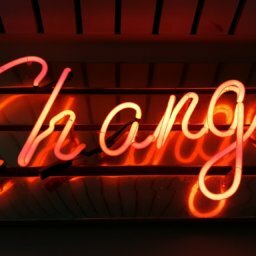 How does savings in Qapital work and what are rules? Rules are what separates Qapital from Digit in my book. Rules in Qapital are basic “if this then that” sort of thing to save you money. There are 7 rules in Qapital where you can really tailor your savings experience. You can also have the Rules to apply to more than one Goal if you want as well, which splits the savings across goals evenly. Save every time you use your card. Options include the amount you can round up ($1-$5) and the Goal(s) you want this to apply to. This triggers every time you use your card. Save when you spend less than your budget. Options include the exact amount you specify, the location based on your linked bank account history (i.e. 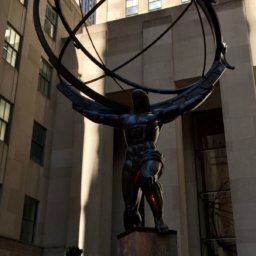 Amazon), the time frame (week or month) and the Goal(s) you want this to apply to. Save when you buy things you are trying to resist. Options include the location based on your linked bank account history (i.e. Amazon), an amount between $1-$50 in dollar increments, and the Goal(s) you want this to apply to. Save a fixed amount daily, weekly, or once a month. Options include the exact amount you specify, an time frame (every day, every week, every month), and the Goal(s) you want this to apply to. Save $1 week 1, $2 week 2 and so on for 52 weeks to save $1378. Options include the saving order (Normal = start with $1 week 1 and go up or Reversed = Start with $52 week 1 and count down), the specific week you want to start on (week 1 through 52) and the Goal(s) you want this to apply to. Use IFTTT (If This, Then That) App to experiment with new ways to save money. Save 30% on every new deposit to your checking account. Options include the amount that Qapital should start saving at (i.e any deposit over $4000), the exact percentage you want to save (1-100% in 1 percent increments) and the Goal(s) you want this to apply to. You may notice one of my rules say Hello Digit. That’s intentional. Every time Digit saves me a few bucks, Qapital will immediately kick in and save a few more. You also see rules for Amazon (my favorite place to shop) and even rules for my utilities payments. This helps builds up my 2 savings account pretty fast. I didn’t go as detailed as I could with any of the rules or setup but I this saves me a nice bit of money per week just with these rules. Even having Round Up at $3 is a lot since I am mainly a card user. So buying groceries, getting gas, buying lunch 2 times a week, paying bills with my card, etc.It adds up. 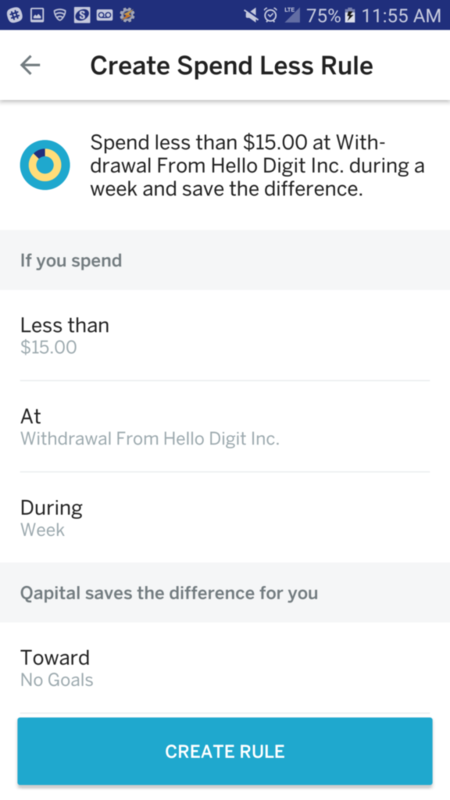 Like Digit, Qapital will automatically save you from overdrafts. Due to the advanced rules and goals in play, Qapital takes a different approach that withholds all requests if your balance dips below $100. Those ‘savings’ will sit on hold for 14 days, OR until your balance goes above $100 and the savings process will begin again, without any input from you. Digit and Qapital is very helpful as another tool in our arsenal in regards to saving money for my raining day fund. And if you are wondering how Qapital and Digit makes money, they get interest from the money stored in their accounts so it is a free service to you. Some people may feel differently about this but I am willing to forgo the interest on a few dollars if it saves money automatically based on my spending habits. I know what my habits and weaknesses are so I focus on using technology to streamline that. And once I get my Digit & Qapital balance to a certain limit, I move the money over to my real savings account. The best future is the one where I have options. By using technology to streamline my decision-making, I can ensure a better future for myself. The best future is the one where I can freely walk away from any outcome I don’t like. Automatically saving for my future using the technology of today. 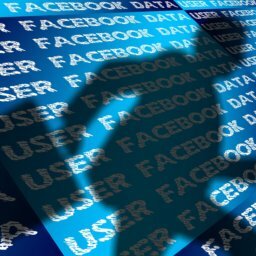 Facebook Data: What is in your Facebook data download?